“Free Leonard Feather(? )” Couldn’t quite make that one out. Okay. Given all that, here’s the assessment. 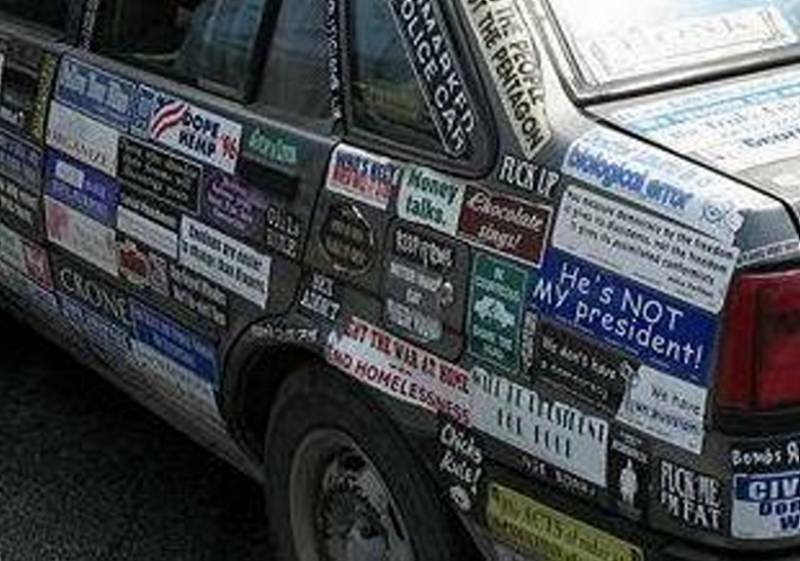 First of all, no guy would do this to his first car knowing what all those stickers would do to a paint job, and that he’d have to scrape ’em all off and pay for a paint job before he could sell it. The owner is a female. Because no guy would deliberately do that to his ride unless it was a complete POS, and that it appears to be a decent Chevy Cavalier, this car was a gift from Daddy. 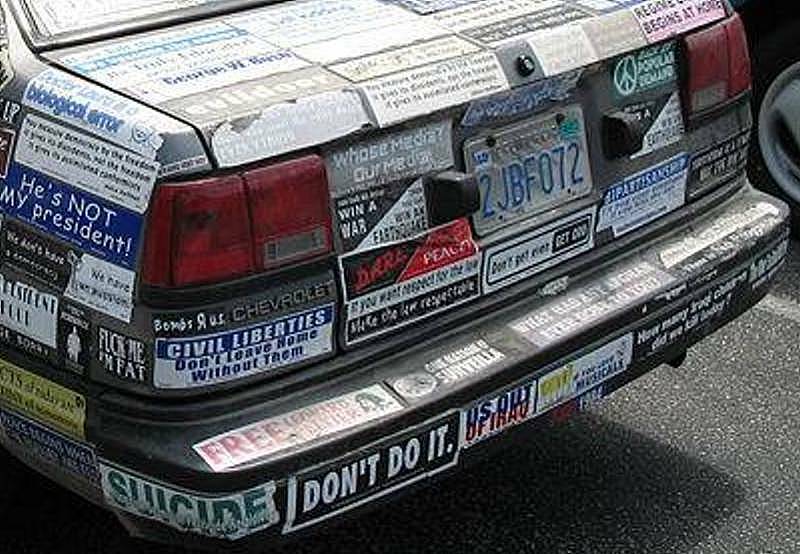 The owner of the OpinionMobile is therefore in college, somewhere in Michigan (the source of the image). She goes by the name of Sascha even though her real name is Amber Lynne. She’s got dyed black hair with a streak of purple, some miscellaneous piercings, and tattoos on her pasty white calves. Did I say she was overweight? No. She did. She’s fat. Fat, pierced and tattooed. And she likes to get stoned. She’s got a pet rat, and her girlfriend’s name is Beverly. Did I say she was a lesbian? No. She did with her Dr. Laura sticker, and she’s never listened to the program. Pure efficient genius. Therefore, this four-wheeled beast of burden without a spare qualifies as a true Babe Magnet… just not in the traditional sense, and, uh, I’m outta here. This entry was posted on Wednesday, 9 April 2008 at 12:05 AM and is filed under Automotive, Babe Magnet, Humor, Odd, Stupid. You can follow any responses to this entry through the RSS 2.0 feed. You can leave a response, or trackback from your own site. 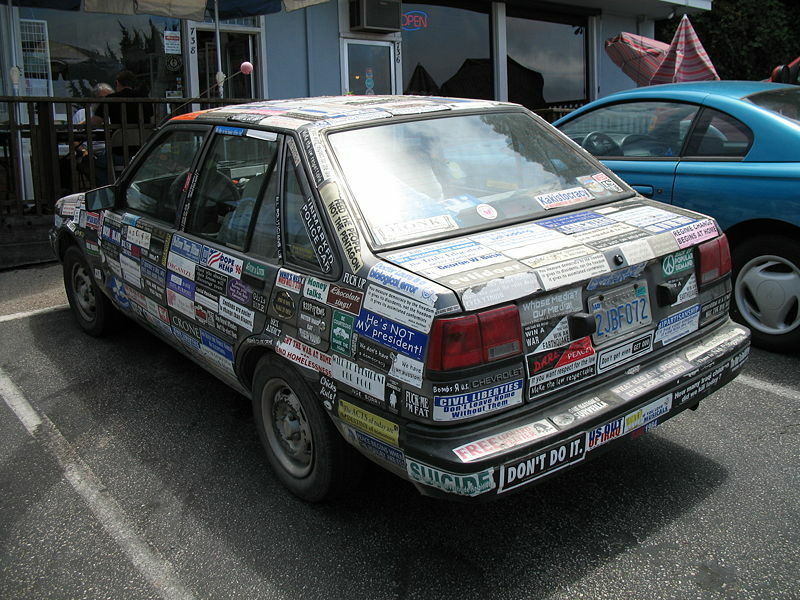 You know, I’d always wondered if there was a car out there that had every surface covered in bumper stickers. Now you’ve found one. Scary. I’m getting old man eyes these days, so it was hard for me to even find the “Free Leonard” sticker, but I’m pretty sure it’s “Free Leonard Peltier” – a member of the American Indian Movement who is currently serving for the murders of two FBI agents, and is considered by some to be a political prisoner. I thing the “Crone” sticker would also allow one to conclude that she’s a Goddess-worshipper. VE– Your wondering days are over. Wheels– I’ve got old man breath. Leonard Feather was a jazzbo dj or something around these parts a decade ago. Blame me… the image quality hurts my earballs, and I completely missed the “Crone” sticker. If I had nothing better to do, I’d send the image off to a jigsaw puzzle maker and have them make a jigsaw puzzle out of it, except without the jigs. All the pieces would be non-interlocking rhomboids with randomly duplicated pieces and at least one piece would be missing. Lily– There are benefits to having a bumper sticker finish: no waxing and little risk of keying. On the other hand, vaseline on the windshield wipers is a downside.